type providers » Tagged "type-providers" » Rash thoughts about .NET, C#, F# and Dynamics NAV. In my last post I described how we can access Dynamics NAV 2009 SOAP web services from F# and the benefits we get by using a type provder. Since version 2013 it’s also possible to expose NAV pages via OData. 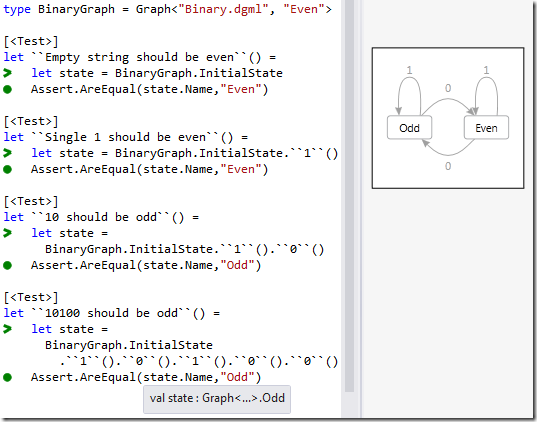 In this article I will show you how the OData type provider which is part of F# 3 can help you to easily access this data. First of all follow this walkthroughÂ and expose the Customer Page from Microsoft Dynamics NAV 2013 as an OData feed. As you can see we don’t need to use the “Add Service Reference” dialog. All service type are generated on the fly. As you can see this approach is very easy and avoids the problem with the manual code generation. If you expose more pages then they are instantly available in your code. 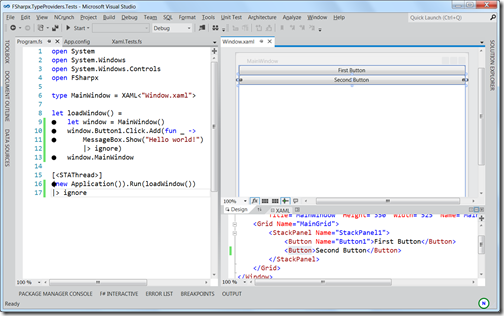 As with the Wsdl type provider you can expose the generated types from this F# project for use in C# projects. FSharpx.TypeProviders.Machine which provides strongly typed access to the Registry and the file system. FSharpx.TypeProviders which installs all of the above type providers. 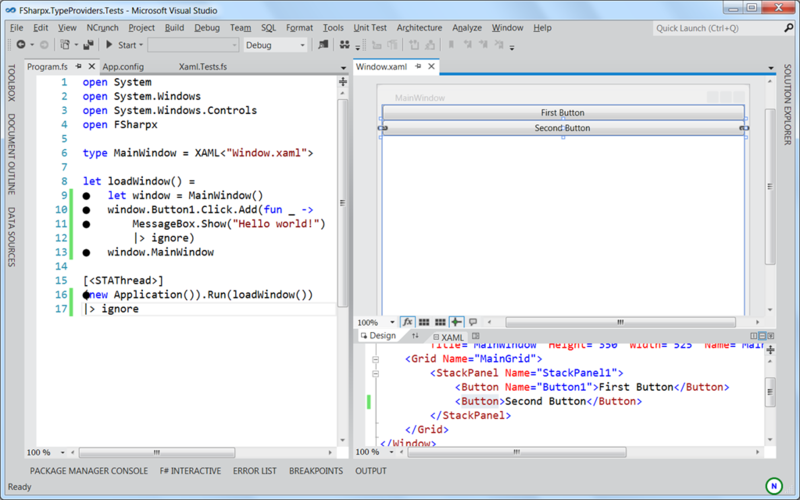 At the moment all type providers should work with .NET 4.0 and .NET 4.5 and F# 3.0. After the official Visual Studio 2012 launch yesterday I think itâ€™s a good idea to announce two new type providers which are based on the DGMLTypeProvider from the F# 3.0 Sample Pack. The first one is only a small extension to the DGMLTypeProvider by Tao. 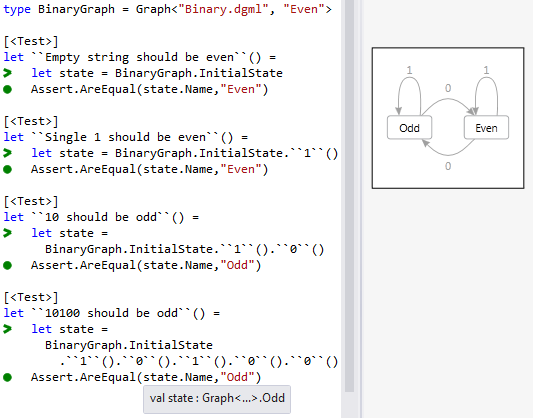 which allows to generate state machines from DGML files. The extension is simply that you can choose between the original async state machine and a synchronous version, which allows easier testing. If you want the async version, which performs all state transitions asynchronously, you only have to write AsyncStateMachine instead of StateMachine. 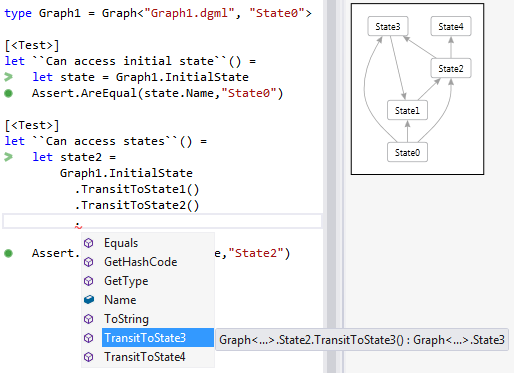 As you can see the compiler knows that we are in State2 and allows only the transitions to State3 and State4. As you can see in this case the compiler has already calculated that 10100 has an odd number of zeros â€“ no need to run the test . 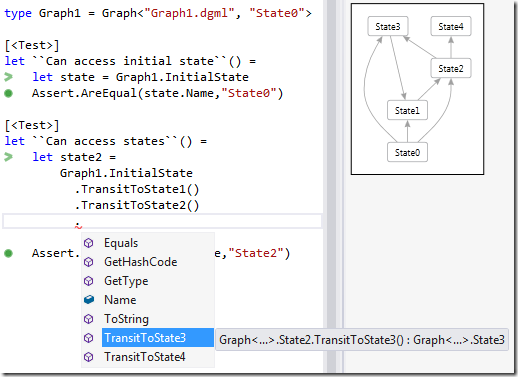 This stuff is already part of the FSharpx.TypeProviders.Graph package on nuget so please check it out and give feedback. 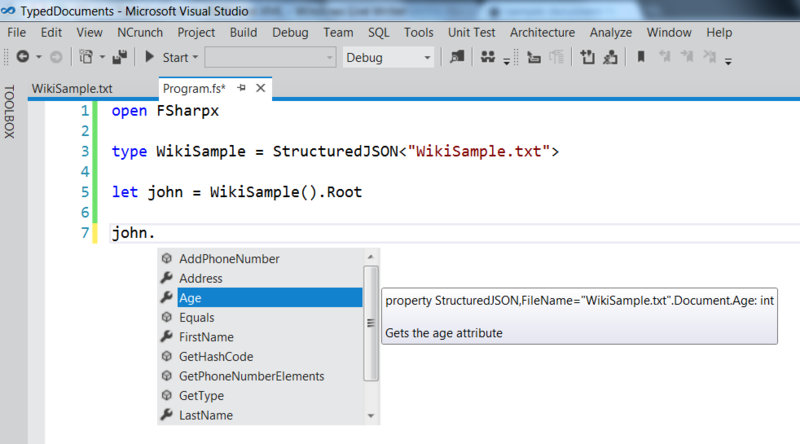 Iâ€™m happy to annouce a new nuget release of FSharpx.TypeProviders. 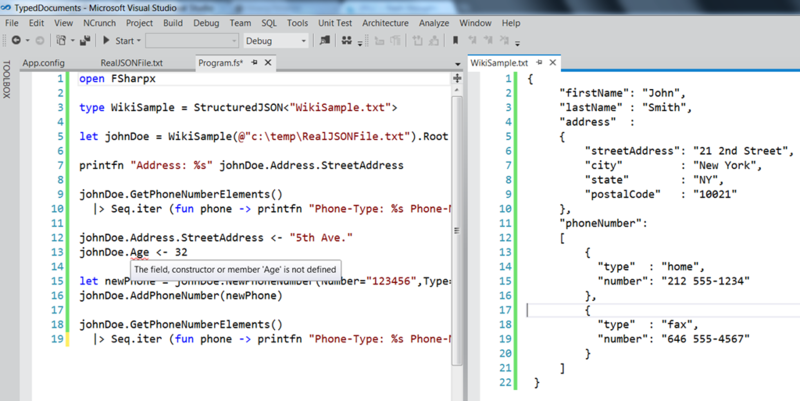 The new version 1.5.3 allows to access JSON and XML in a strongly typed way. These new type providers are based on an XML type provider by Tomas Petricek. I added a write API and a JSON version. 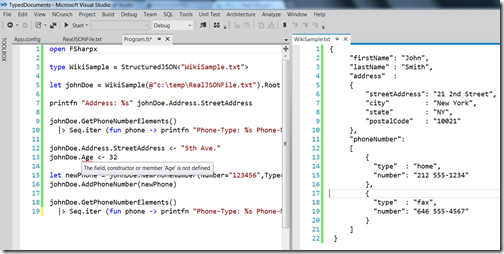 Whereas XML allows different ways to define a schema, JSON has no schema. Nevertheless most documents have some kind of an implicitly defined schema. These new type providers try to infer the schema from a sample file and provide you types to access any file which is conform to this schema. Letâ€™s take a look at some of the new features. Enjoy your statically typed JSON/XML documents.